Today it’s the second of four battles comprising the Elate Eight as Dietrich Bonhoeffer faces off against Jerome. Could there possibly be any saintly kitsch for these two? A Vulgate Snuggy perhaps or a Bonhoeffer chew toy for your puppy? Let’s see what our intrepid Celebrity Bloggers dug up. In yesterday’s Elate Eight kick-off, Mary Magdalene made quick work of Evelyn Underhill 77% to 23% to make it to the Faithful Four. She’ll face the winner of tomorrow’s match-up between Margaret of Scotland and Enmegahbowh. To get to this round Bonhoeffer beat James and Brigid while Jerome defeated John Patteson and Philander Chase. Click on the links in the previous sentence if you need a refresher course on today’s combatants. And check the updated bracket for upcoming battles. Those who like to hug trees and, therefore, dislike buying “stuff” might want to reconsider that noble and principled position after reading about this t-shirt, which is made from 100% certified organic cotton and, therefore, green both in color and in composition. It comes with a quote from Bonhoeffer to disturb the consciences of those who cross your path each day that you put it on. It is also, as stated on the website, “kind to the environment,” so how could you not feel guilty wearing something else. Lastly, it appears to be “signed” by Bonhoeffer himself in a cursive-like font. Alternatively, if you prefer to be a little more subtle in your public witness, there’s a plain white t-shirt available with a simple drawing that’s based on a pop ular photograph of Bonhoeffer. Here’s the rub: You’ll either have to tell everyone the identity of the person on this article of clothing or use it to weed out the theologically and historically uneducated folks in the crowd because Bonhoeffer’s name doesn’t appear on it. 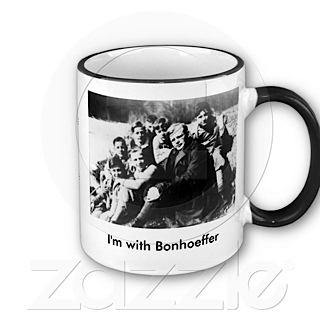 Over at Zazzle, there are a couple of Bonhoeffer-related coffee mugs that you might want to add your collection (but only after obtaining your official Lent Madness coffee mug, available out there somewhere on the interwebs). One features a picture of Bonhoeffer surrounded by a group of young people and declares, “I’m with Bonhoeffer.” The other has a picture of the ten statues of 20th-century martyrs, including one of Bonhoeffer, that can be seen above the west doorway of London’s Westminster Abbey and represent those who have died under oppression and persecution. If you thought there would be little to no kitsch involving the author of the Vulgate, you’d be wrong. Jerome is well represented in the saintly kitsch department. If coffee isn’t your first thought when considering Jerome, surely your second thought MUST be a doll. “St. Jerome lived as a hermit in the Syrian Desert, and it is reported that he once removed a thorn from a lion’s paw, and the lion remained at his side for years. Measures 18” ta ll with head and hands made of flexible urethane rubber attached to a soft poly-fil cloth body.” What is particularly stunning is that this doll “becomes a lion when flipped inside-out.” Not only that but it “Includes a Certificate of Authenticity.” Perhaps it’s even signed by Jerome himself. 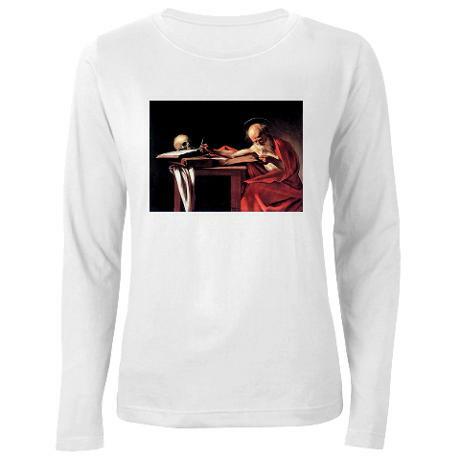 Then there’s the St. Jerome T-shirt, complete with long sleeves for t hose cold desert nights. And for lowering the chance of sunburn. But wait there’s more. Do you love Jerome? Wear your heart on your sleeve, or at least on your chest, with this snazzy short-sleeve t-shirt. Finally, there’s the Jerome keyring complete with image of Jerome’s unlockable cave. 62 Comments to "Dietrich Bonhoeffer vs. Jerome"
The good Dr. Bonhoeffer took his translation of the Scriptures and lived them out … the extra step that pushes me to do the same. Jerome’s kitsch is better, granted, but that’s not going to persuade me today! My rector is a big fan of DB and quotes him often – I will have to find out if he knows about the shirts and mugs. In honor of said rector, who promised me he’d vote for Philander, my vote goes to DB. 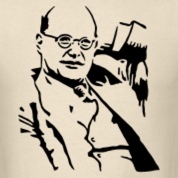 I like the Bonhoeffer t-shirt, and yes, it would take some explaining! The reversible Jerome doll totally won me over today, so I am voting for the underlion. As did I! Finally, I get to vote for the Lion! Totally laughing out loud–gotta love the underlion! Really, the Bonnehoeffer kitsch is kind of unfair as it is more inspiring than kitschy. He really is action-figure-worthy. This might not count as kitsch, but he was portrayed by Mike (“M*A*S*H”) Farrell in the 1996 documentary “Hanged on a Twisted Cross,” narrated by Ed Asner and co-starring Wink Martindale. 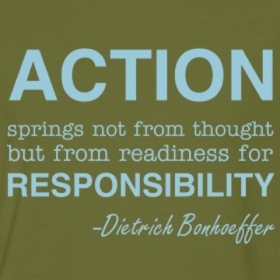 With or without refrigerator magnets, Bonhoeffer gets my vote today. Reversible lion? Let your inner lion ROAR! I will not mention yesterday. i will not mention yesterday. i will not mention yesterday. I will go with Jerome, because he was a dedicated translator. 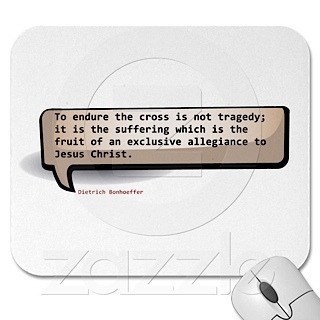 However, Bonhoeffer has all my respect and admiration. I am very upset today with Mr. Ratzinger, who met with Fidel Castro, the filthy dictator of my country. In opposition, Lent Madness is offering today a sample of another German who opposed the tyranny that led his country to disaster and doom. I got here by searching for St. Jerome merch. 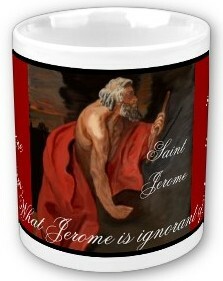 I’m a translator, and St. Jerome is our patron. I seriously want to know where to get the mug and / or t-shirt and / or doll. I found the keyring at Zazzle, but none of the other items. I want to make my colleagues green with envy at our next conference! Please advise! Here’s where the St. Jerome doll is. It’s the only one I searches for. I really want one of those Bonhoeffer mugs. I pray that God will raise up faithful folk who will follow his example. The “underlion?” 😉 But, “Cheap grace” carries the day for me. I confess to being a bit prejudiced toward DB, partly because of some research I did a few years back for a presentation on him (during Lent!) at our parish’s Wednesday night Lenten soup supper. So there, I’m out! (BTW, the pen and ink drawing tee comes in lots of colors, long or short sleeves, and there’s even a hoody. Just don’t wear it in certain neighborhoods in Florida.) On to the Golden Halo Dietrich! Well, here we are. I’d like to offer a slightly-less-than-saintly kitsch observation about my friend, Pastor Bonhoeffer. Dietrich was on Hitler’s “Kill This Guy” list before he became Chancellor. Dietrich was forbidden to speak in public, barred from the church, and only because of his personal and family status remained at liberty. When the war came, it was clear he would be drafted into the army and sent someplace where he would conveniently have a training accident. Reluctantly, he joined the Abwehr (German Military Intelligence), not to plot against Voldemort, but to survive, for Abwehr was the one place in German Hitler could not reach him. From his relative safety, he helped coordinate escape from Germany for others in danger (at least once driving a fugitive over the Swiss border himself, bold as brass.) Dietrich was able to travel with his Abwehr papers, to meet his friend, George Bell, (Bishop of Chichester). And thus, Bonhoeffer’s role in The Plot: to conspire with Bell to open a communication channel with the British government. And so, Pastor Bonhoeffer began a year of daily interrogation to learn about the doings of the Abwehr, and he managed to stay ahead of his inquisitors, never giving up names of the conspirators. Legend has it that the prison guards forsook the bomb shelters during the nightly bombing of Berlin for the security of Bonhoeffer’s tiny cell, crowding in while Dietrich stood at the window, smoking the powerful cigars he favored (smuggled in by the guards) and writing letters (smuggled out by the guards) to his former seminary students serving in various posts in the army, carrying out their own, underground pastoral service. Through Eberhard Bethge, the web was woven, and the survivors went on to re-establish the Church in Germany, east and west, after the war, and were instrumental and essential to the peaceful reunification of Germany. As the war moved inexorably to the nazi defeat, Hitler gave a list to the Gestapo of those he had decided would die, and not outlive the Reich. Bonhoeffer was taken to a concentration camp, and then to Flossenburg, a killing place where he was he celebrated Sunday service with his fellow prisoners, and removed for execution. His last message was, “This is the end — for me the beginning of life.” And so it was. And, so, may it be for us all. Thank you for taking the time to write this lovely Bonhoeffer story for us. Yes — thank you, Don! I was very conflicted with today’s selection, however your description of Bonhoeffer’s efforts won my vote. I have a theory: that winners of the various matchups tend to be the more modern of the two. So, in true diaconal contrariness, it’s Jerome for me! I think that may be because it is easier in many ways to identify with the more modern saints… their lives seem more like our own so it is more possible to aspire to be “like” them or see them as role models. Not the least reason of which is that the older saints are shrouded in hagiography which is somewhat repellant to not just our modern sensibilities, but perhaps also the progressive mainline sensibilities of many of us voting in Lent Madness. 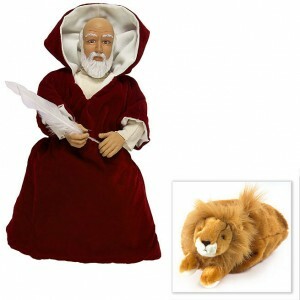 Really, really love the Jerome/Lion doll – but it’s hard to pick against the martyr…. First, how did Don get all that in his reply? When I got carried away, mine suddenly disappeared…..OK…it wasn’t scholarly but it was sincere ! Second, the kitsch is FABULOUS and I am trying hard not to entertain thoughts of withholding part of my monthly pledge to buy lots of stuff I don’t need because that’s not the issue: GREED IS ! It’s now obvious Lent hasn’t done all I need it to do. Lastly, the guest contributors have my greatest admiration. 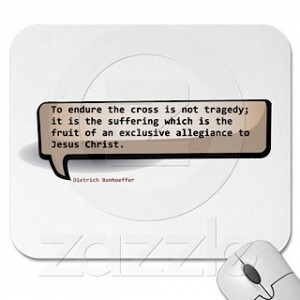 Finally…Bonhoeffer to the finish line as he must prevail against all comers ! And now, which T-shirt? I need another coffee mug like I need a …..well, whatever I don’t need. Don probably pasted his stuff in from another document – which would keep the “time out” feature from refreshing the box. Oh, I have hit my “who do I vote for” wall. Bonheoffer stood on Jerome’s shoulders to reach the heights of martyrdom. All Christians stand on Jerome’s shoulders! But Bonhoeffer showed how far the reach could and must be. Both men totally dedicated to Christ… We saints all depend on the saints before us. Sigh… who to vote for? Probably the one carrying the largest load: is that all of Christianity like Atlas (Jerome) or martyrdom like Dietrich? @Grace: It is troubling to think we need to judge one to be better, or greater than another. Maybe it is enough to just vote for those who we remember when our days get hard. Like Wednesday. Who is the patroness of Wednesday ???? I like that idea Don. “Who do we remember when the days get hard…” That works on a lot of levels. I think I’ll go around today thanking my “everyday saints” for their very tangible support when my days get hard. An attitude of graditude. I must say, if I were voting solely on merchandise Jerome would win this whole contest hands down for that “authentic” (oooooh!) Jerome/lion doll — *best* Transformer *EV-ER*!! Like aleathia I am now battling a greed demon and trying to keep my credit card in my wallet. You have done your job well, Bosco Peters! Yesterday, several commenters were concerned with two women in the match-up, combined with the kitsch theme of this round. I hope, having seen the silly stuff available for Jerome and Dietrich, that they are satisfied. I find that today several folks have made comments that say a lot. It is true that many of the more modern saints stand on the shoulders of the saints who came before. I have also noted in Lent Madness that there seems to be a bit more support for the newer saints over those from the past. 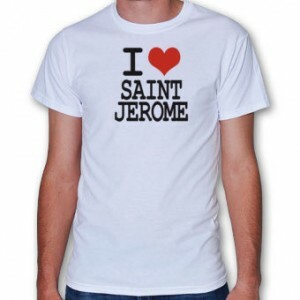 Following in the fine Episcopal belief in tradition I must vote for Jerome. We all are called to Costly Discipleship. Is there any other kind? The reversible Jerome-lion doll ranks up there as one of the best kitschy items ever — even better than yesterday’s Mary Magdalene WisdomDoll. (Though I still have great affection for the 10 plagues fingerpuppets that I ran across yesterday while surfing the web.) I’m maintaining my trend of voting in Elate Eight round for the saint that doesn’t have a commercially available puppet/doll figure. Yesterday, Evelyn; today, Dietrich. Tomorrow, it’s Enmegahbowh vs. Margaret so I may have to change my voting strategy – but I’m not underestimating the Celebrity Bloggers’ skills to find some amazing stuff! A quick check on the web indicates there’s plenty of Margaret of Scotland kitsch. So it looks as if it’s going to be Enmegahbowh tomorrow since I can’t find any Enmegahbowh dolls or puppets. But I was going to vote for him, anyhow — Margaret hated the Celtic Church and the Gaelic language, which galls this descendant of Gaelic Highlanders! Jerome gave us more than just a fairy story with a big cat. Hard to make this choice. Is it really modern vs ancient or are we all just moved by sacrifices made by people that are closer our time? Everyone seems to be thinking about future brackets. In that case, I urge you to all go on twitter and view @MapleAnglican’s fabulous PR ads for Thomas Cranmer. Hashtag #Lentmadness, of course. After reading so many wonderful posts, the decision was finally made for Jerome. But it is great that God allowed one saint to have a lion at his side (I want that doll! 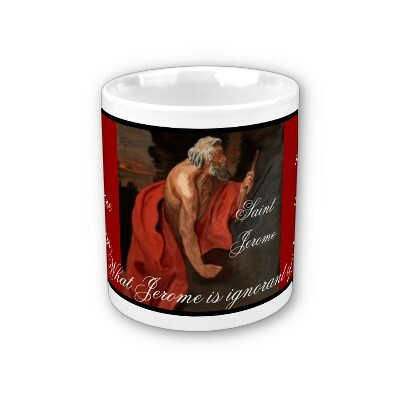 ), and the other saint to enjoy powerful cigars (and a coffee mug!). I wonder if I can convince the kids to vote Bonhoeffer before they see the doll that reverses into a lion…. @ Anne-Marie, I’m rather sure how the vote will turn out here once Hope and Skye get home from school and see Jerome and the “underlion” !!! The more I learn about Bonhoeffer (& not just here) the more I like hi m, and the cigars almost got me, but my cat won’t let me not vote for the lion. Besides , isn’t Jerome the only saint quoted in the 39 articles? I think also St. John and St. Augustine . . . I didn’t even mention the lion to my cats! I spoke too quickly; St. Paul and St. Augustine are also quoted by name (but I couldn’t find St John). BTW, aren’t you the Sr. MW that Diane and I knew at St. Cuthbert’s House? St. John in Article XV. Yes, currently in the Diocese of Easton. We should catch up when all this madness is over — something to look forward to . . . in addition to Easter, of course! I know the cat he is talking about. You bet she won’t tolerate such nonsense as not voting for the lion! She had “words” with me this morning. I’m not saying how I voted. Those claws make one think hard…. A really tough one today. I voted for both of them in previous rounds. I really admire Bonhoeffer but that Jerome/Lion doll. . . But a reversible lion doll!? If I casually voted for both? Leads me finally, at last, to my vote. In quickly skimming through “The Cost of Discipleship” this afternoon, I wonder what St. Dietrich would think about Communion without Baptism? Funny you should mention that — I just finished a pair of articles on the subject for our parish e-letter. I read your article and found it interesting. What I really appreciated is the fact that it leaves me wanting to think a bit more about it. In other words your piece makes one think instead of giving them answers. Father Chris’ question really adds a new element when you try to factor in Bonhoeffers solution to the “Jewish Question” that would have required Jewish people to accept Jesus and convert to christianity. I may be going down a false trail here but I will certainly enjoy trying to puzzle it out. Hope and Skye voted for the ‘not so cowardly lion” aka Jerome! I don’t get it. I do not understand this “kitch” of the saints. After all the great info & stories & comments, I find these parodies of saints’ memorabilia distasteful. I have also laughed at Scott & Tim’s Monday Madness repartee but today your rebuttal comments regarding others’ dislike of this kitch was down right rude & uncalled for. I will finish Lent Madness because I want to participate in this game. I sincerely hope that you regain your sportsman-like behavior & contain your comments to the saints for all our edification & good fun. Great kitsch today! LOVE the reversible Jerome/Lion doll. His kitsch was better than Bonhoeffer’s, so it almost swayed my vote. But had to go with the Nazi fighter in the end. I also find the folks who don’t get the kitsch hysterical. Have they not seen the humor in the whole tournament? I think there are different kinds of humor, and different people have varying sensitivities to what they consider distasteful or disrespectful. I find LentMadness as a whole to be primarily witty humor and a light-hearted way to learn about the saints. The kitschy stuff isn’t witty and doesn’t have the educational component that the earlier rounds did, so I can definitely see how some folks perceive it as very different. Ow. You people have a penchant for giving one hard choices. I like Jerome, I think that in another time/place we could have been the best of friends but anyone who can stand up to the nazis, even at the cost of their own life, has to get the vote. on a side note…..Mica, lighten up, you’ll live longer(I’m blowing a raspberry at this point). a sense of humor is truly a valuable asset to have in these insane times. Guess I go with Bonhoeffer. He was very brave and could be beautiful.